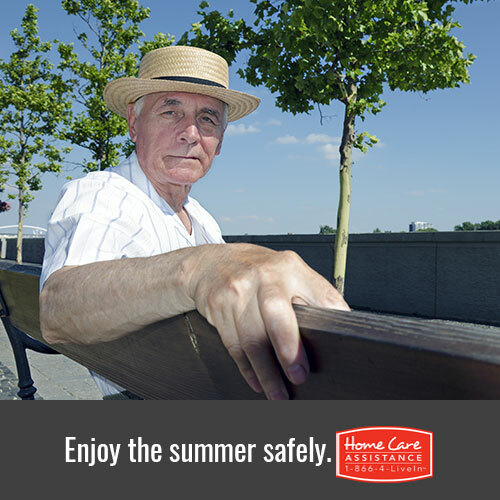 At Home Care Assistance of Harrisburg, we want to remind our readers that the summer season is accompanied by a significant increase in temperature, which can endanger the health of older adults whose bodies naturally have a difficult time cooling down. When a senior’s body begins to overheat, the side effects result in heat exhaustion, a very serious condition that may require medical attention if left untreated. Help your loved one enjoy a safe summer by learning about heat exhaustion and how to reduce risk. Heat exhaustion can be caused by acute exposure to heat, but it can also be caused by constant exposure to elevated temperatures over several days accompanied by inadequate fluid intake. Seniors are at greater risk of developing chronic heat exhaustion because many do not consume adequate fluids due to loss of the sense of thirst. The warning signs of heat exhaustion include heavy sweating, paleness, muscle cramps, headache, fatigue, fainting, dizziness, fast and shallow breathing, and a fast, thready pulse. Any senior exhibiting these symptoms should be moved to a cool location and encouraged to consume water. When the signs and symptoms of heat exhaustion are left untreated, heat stroke, a more complicated and serious condition, develops. If a senior’s temperature remains at a high level (typically over 103 degrees Fahrenheit) long-term complications such as brain damage and organ failure can occur. Seniors who live alone should be especially careful as daily activities will likely be more difficult and take more energy in the hot weather. Families should check-in on their loved ones or look into professional Harrisburg hourly home care where a trained and reliable caregiver can assist with daily activities, ensuring safety and maximizing comfort. To learn more about hourly or live-in home care from Home Care Assistance of Harrisburg, call (717) 540-4663 and schedule your complimentary, no-obligation consultation.